Workers at Lambkin Tobacco sort tobacco leaves. There’s a fascinating description here of the company which I will unashamedly copy. I’ve seen too many great resources disappear into the aether when a site goes down.. In the early years of the century Lambkins tobacco factory in Fishers Street Merchant’s Quay, Cork, Ireland was thriving. 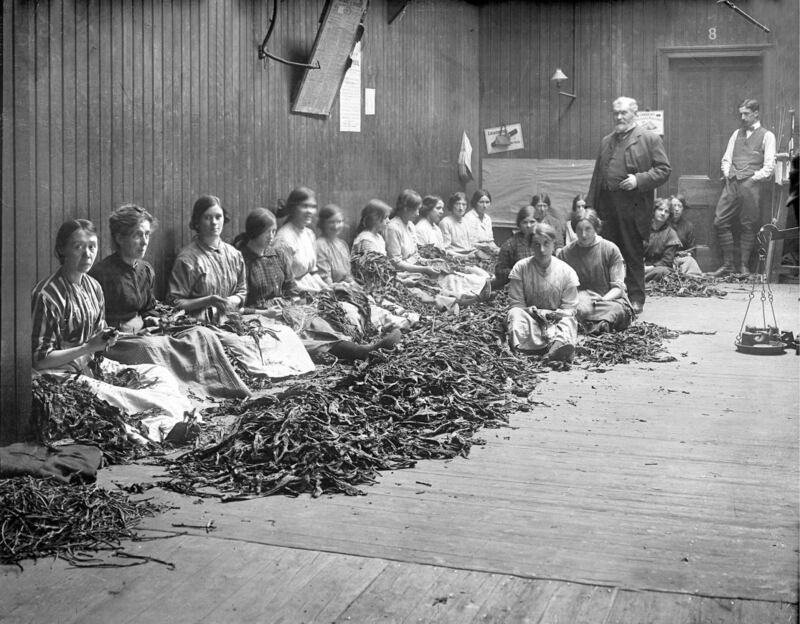 These fascinating pictures of the ladies sorting tobacco leaves and another group packing tins were taken during the first World War. The tins were for dispatch to front line troops and it was said that the ladies often packed a love message in the tins! LAMBKIN SNUFF AND TOBACCO FACTORY, CORK Just as the origin of the Lambkin family is shrouded in mystery, so is the date of foundation of the Lambkin Snuff and Tobacco Factory. Family folklore says that it was founded in the 1650’s. Jane Croly, the daughter of James Lambkin (1802-1866), saw a Lambkin letterhead stating “Lambkin Bros. & Co. Founded in 1730”. In the Cork Examiner on October 2nd, 1933, there is an article entitled “Ireland’s Oldest Tobacco Factory” (see below) which stated that the Lambkin Brothers Cork dated back some 200 years which agreed with the above statement by Jane Croly. The publication “Cork: It’s Trade and Commerce 1919″ stated that the factory was founded 150 years previously behind their retail premises in Patrick Street, indicating approximately 1769. However, a half page advertisement in the same publication stated it had been established for over 100 years, which would make its foundation prior to 1819, which date is undoubtedly too late as there is a deed in our possession, dated April l5th, 1801, which stated that James Lambkin, tobacco manufacturer, had properties in the Coal Quay which had ” by then for some time past been in his possession”. In any event, the manufacture of tobacco and snuff is one of the oldest industries in the City of Cork. It was there that the second tobacco factory in Ireland was established, the first being in Dublin. Snuff was manufactured in Cork towards the close of the 18th Century when the Lambkin Brothers set up a snuff factory at the Coal Quay. The business was so successful that they soon extended their activities to include tobacco sales and they opened new premises on Patrick Street. By the middle of the 19th Century, the Lambkins had joined the elite band of Cork’s Merchant Princes. Almost all of the tobacco consumed in Ireland was manufactured there. Remarkably, however, though the great Irish Famine depressed the whiskey trade, it boosted that of tobacco and snuff. Consumption in 1884 was 5,128,850 lbs. of tobacco, and by 1847 this had risen to 5,949,691 lbs. At this time, Lambkins of Cork and Lundyfoot of Dublin had also secured firm footings in the English market for their snuffs, for the “relief of the jaded Statesman or overworked lawyer”. The Lambkin Brother’s “high toast” snuff was also much valued in Belfast. Until about 1850 “roll tobacco” and snuff were the only types of tobacco product manufactured in Cork. Subsequent to that, there was a demand for “plug” tobacco, which was then manufactured in Cork while there continued to be a large demand for the Irish roll tobacco in England. There was a rapid decline of the popularity of snuff towards the end of the 19th Century and Lambkins kept with the times by changing over more to tobacco products other than snuff. The Lambkin factory manufactured smoking mixtures, cigarettes and other tobaccos and gave extensive employment. Lambkins “Tipperary” and “Exhibition” mixtures obtained wide popularity and prior to the First World War, the chief market for Cork tobacco was of course the South of Ireland, though the export trade was increasing. With the outbreak of The First World War, however, Lambkins exported large quantities of mixtures and plug tobaccos from the war office to various Expeditionary Forces. The fighting men in France and other theatres of war have born constant testimony to the excellence of the Cork mixtures. When the Irish Free State was formed in 1922, Gallaher’s retired from Ireland and this enabled Lambkin Brothers to secure some of the most modern machinery from them which allowed a considerable increase in their output and all their brands were then manufactured by the most up to date methods. Practically all the leaf for the tobacco manufactured in Cork came of necessity from America. In about 1900, Robert Lambkin, who was an expert tobacco grower from Sumatra, pioneered the growing of tobacco in Ireland and he grew for Lord Dunraven a crop of 13 acres with remarkable success. Indeed a Cork Examiner representative in 1933, was shown cigars and tobacco grown in County Cork by Robert Lambkin which were manufactured in London by a well known firm of cigar manufacturers (see below). Tobacco grown in Ireland was not quite suitable alone but was excellent for blending purposes. There was considerable interest in this in the first third of the 20th Century, however, the uncertainties of the climate during the spring months and the need for a fairly fine summer and the absolute necessity for the avoidance of frost, made it very difficult to grow in Ireland. Thomas and John Joseph, sons of Robert Lambkin (1803-1871), owned Lambkins Snuff and Tobacco Factory after Robert died and John Joseph left Thomas his share of the business when he died on September 24th, 1882 this was valued at 2910 lbs 19 shillings and 4 pence. When Thomas died in 1891 his family wanted to move to London, so Thomas’ widow Anne’s brother, James Lambkin Lyons, bought the factory so they were free to go. Thus Lambkins passed to the Lyons family, in whose possession it remained until the factory closed in January 1951. Anne’s daughter Sis Lyons inherited it from her brothers and was the last owner of Lambkins. She sold it all except for the shop which she kept for her nephew, Jack Lyons. He ran it until 1965, the year before his death, when he sold it prior to his retiring to Portugal, where he died of a heart attack on his 50th birthday, on January 20th, 1966. Thanks for sharing! 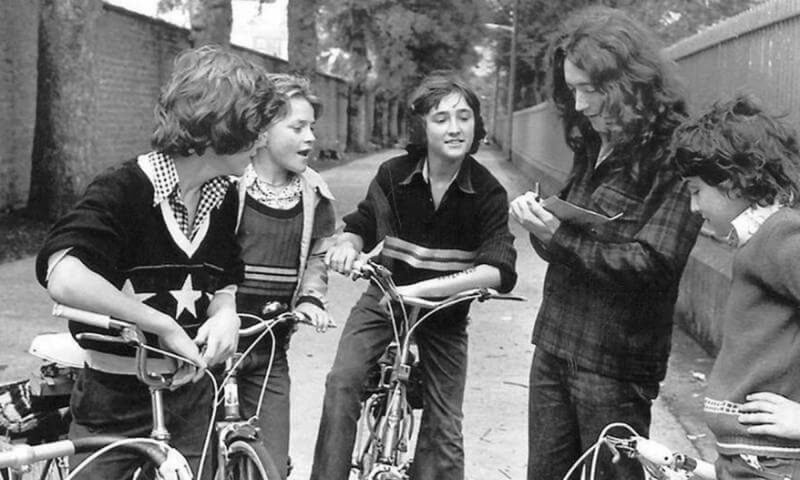 Great history of the family. Previous PostPrevious British troops pulling out of Victoria Barracks (Collins Barracks) in 1921.